Also known as the spectacled cobra due to spectacle markings on the hood, the Indian cobra is a prominent species of venomous snake among reptiles. 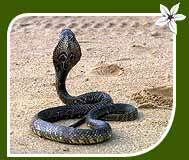 In a country like India, the cobra is both respected and feared; it occupies an important place in the Hindu mythology. Indian king cobra can be seen curled around the neck of Lord Shiva in all the temples dedicated to the very lord. Vishnu is also depicted reposing on the body of Sheshnag, the sacred serpent with multiple cobra heads. Even more interesting is the tradition of cobra-and-mongoose fight that still continues in many parts of the country. For snake charmers in India, the cobra happens to be the snake of choice. Indian king cobra has two circular ocelli patterns (connected by a curved line) on the backside of its hood. However, specimens with single ring marking have also been found in the state of Assam and eastern regions of India. An average adult cobra measures between 120 cm and 150 cm. It rarely reaches the length of 210 cm. These oviparous cobras lay 10-24 eggs in the month of May. The newborns of the cobra are a little less than 30 cm in length and are much more aggressive than adults. While being irritated, the cobra raises the front (about 1/3 rd of its body) and spreads its hood; this threat-display posture makes it all the more popular. More aggressive at nighttime, the Indian cobra prefers to live in thickly populated areas, open forests and farmland. Nonetheless, they can also be spotted in cities where they thrive on rodents in sewers and underground drains. Besides rodents, its prey includes lizards, birds and frogs. After a sharp bite, the cobra waits for its prey to be paralysed. The venom of this snake causes the failure of nervous system or even death of the prey. As soon as the prey becomes restless or is dead, the cobra swallows it whole. 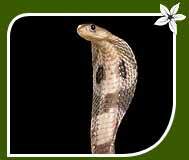 The Indian king cobra can be easily spotted in the wildlife sanctuaries and national parks of India. So, be ready to watch this fascinating species of reptiles as it raises its body, spreads its hood and spits venom to defend against the enemy.